Comparison of postoperative linear analog pain score at rest (mean ± SEM) for patients who underwent unilateral endoscopic total extraperitoneal inguinal hernioplasty with and without stapling of the mesh. Comparison of postoperative linear analog pain score on coughing (mean ± SEM) for patients who underwent unilateral endoscopic total extraperitoneal inguinal hernioplasty with and without stapling of the mesh. Hypothesis Selective non-stapling of the mesh during unilateral endoscopic total extraperitoneal inguinal hernioplasty (TEP) may reduce postoperative pain and morbidity rate. Setting Division of general surgery at a university-affiliated teaching hospital. Patients Two hundred patients who underwent TEP. Intervention Endoscopic total extraperitoneal inguinal hernioplasty with and without stapling the mesh. The mesh was stapled when the diameter of the hernial defect was greater than 4 cm or there was an inadequate overlap of the defect by the mesh. Main Outcome Measures Postoperative pain score and morbidity rate were compared between patients who had stapling and selective non-stapling of the mesh during TEP. Results Demographic features, hernia types, and mean operative times of the 2 groups were comparable. Postoperative pain scores upon coughing from the day of operation to postoperative day 6 were lower in patients who had not had the mesh stapled, but the difference was not statistically significant. Comparisons of the mean length of hospital stay, postoperative morbidity, and time taken to resume normal activities showed no significant difference between the 2 groups. With a mean follow-up of 1 year, no neuralgia or recurrence was noted in either group during follow-up. Conclusions Selective non-stapling of the mesh did not confer short-term benefits, such as reduced postoperative pain and morbidity, compared with those who had routine stapling of the mesh during TEP. For patients with a hernial defect measuring less than 4 cm, TEP can be performed without stapling the mesh. The selective non-stapling strategy also helps to reduce the cost of the operation and the potential for nerve entrapment. IN 1999, Hollinsky and Hollinsky1 performed an in vitro study measuring the balance of forces acting on a nonfixed mesh placed between abdominal muscles and the peritoneum. The tissues were harvested from 20 human cadavers 5 to 24 hours post mortem. To counteract the migration of a mesh by shear forces, the minimum overlapping surface area between the mesh and the abdominal wall should exceed the size of the hernial orifice by 4.16 times. For a hernial opening with a diameter greater than 4 cm, stapling the mesh is suggested to enhance the bursting strength of the repair and prevent subsequent migration. Based on this finding, our institution has adopted a selective non-stapling approach during unilateral endoscopic total extraperitoneal inguinal hernioplasty (TEP) since February 2001. Stapling was performed only when the diameter of the hernial defect was greater than 4 cm or there was an inadequate overlap of the defect by the mesh (<3 cm). Wantz2 considered the avoidance of stapling to be a step forward in the evolution of TEP. However, there has been no consensus on the indications for stapling the mesh. 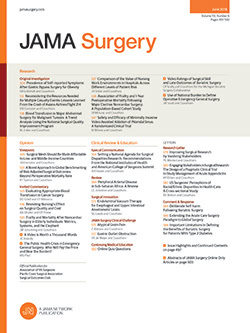 Although encouraging early outcomes following TEP without stapling of the mesh had been reported from a number of centers,3-6 recurrence of hernia had also been attributed to inadequate mesh fixation by other studies.7-10 The effect of prosthetic stapling on early outcomes, such as postoperative pain, following TEP has rarely been studied. The objective of this study was to evaluate any short-term benefits of the non-stapling strategy on early postoperative outcomes and recovery. Patients were operated on in a supine Trendelenburg position under general anesthesia, using a 3-port technique. Urinary catheter and balloon dissection of the extraperitoneal space were not used. A 10-mm subumbilical port was placed using an open cut-down technique. The second trocar port was placed over the midline, about 8 cm from the pubis. Extraperitoneal space was insufflated with carbon dioxide to a pressure of 10 mm Hg and was dissected and created by endoscissors with diathermy. A 5-mm reusable trocar was then inserted at the anterior axillary line, 4 cm proximal to the anterior superior iliac spine. The hernial sac was then dissected and reduced. This was followed by parietalization of the spermatic cord for a distance of 4 cm. A polypropylene mesh of 10 × 14 cm2 (Prolene Mesh; Ethicon Ltd, Somerville, NJ) was used to cover the hernial opening with a minimum overlap of 3 cm on all 4 sides. For the case group, the mesh was anchored to the Cooper ligament, rectus muscle, and transversus abdominis muscle with an endostapler (Multifire Endo Hernia 0°; US Surgical, Norwalk, Conn). The position of the mesh was checked during deflation. All skin incisions were infiltrated with 10 mL of 0.5% bupivacaine hydrochloride before wound closure. Patients were allowed to resume a normal diet and normal activities immediately after the procedure. All patients were prescribed an oral compound analgesic, proproxyphene (50 mg) and paracetamol (325 mg), 4 times daily, and sustained-release diclofenac sodium (100 mg/d, on demand). Severity of postoperative pain at rest and upon coughing was assessed daily using a linear analog pain score with a scale of 0 to 10. All patients were instructed to complete a pain score chart daily to document their pain after discharge from the hospital. The length of hospital stay referred to the total number of nights spent in the hospital after the procedure. All patients were followed up at the hernia clinic by the operating surgeon one week after discharge. The length of convalescence required before normal outdoor activities could be resumed was documented. All complications were recorded and any clinical recurrence was documented. Statistical differences between groups were determined by the t test and χ2 test where appropriate. P<.05 was regarded as significant. Statistical analysis was performed using computer software (SPSS/PC + 9.0; SPSS Inc, Chicago, Ill). Values were expressed as mean ± SD. Comparisons of the demographic features and hernia types between the 2 groups are presented in Table 1. Four patients in the stapling group underwent concomitant procedures, including umbilical hernia repair (n = 1), Jaboulay operation (n = 1), orchidectomy (n = 1), and excision of lipoma (n = 1). Another 4 patients in the non-stapling group underwent concomitant laparoscopic cholecystectomy (n = 1), Jaboulay operation (n = 1), and umbilical hernia repair (n = 2). The mean ± SD operative time taken for TEP with and without stapling of the mesh was 63 ± 21 minutes and 63 ± 20 minutes, respectively (P = .05). All but one were successfully performed. Only 1 patient in the non-stapling group required conversion to open repair because of adhesions. Postoperative pain scores at rest from the day of operation to postoperative day 6 were comparable between the 2 groups of patients (Figure 1). The postoperative pain scores upon coughing were consistently lower in patients in the non-stapling group. However, the difference was not statistically significant (Figure 2). Table 2 presents the postoperative morbidity of the 2 groups of patients. All morbidities resolved spontaneously without the need for surgical intervention. There was no significant difference in the postoperative morbidity rates between the 2 groups. The mean ± SD length of hospital stay was 1.7 ± 1.57 days and 1.4 ± 0.83 days for patients who underwent inpatient TEP with and without stapling of the mesh, respectively (P = .09). Both groups of patients returned to normal outdoor activities in an average of 3.7 days (P = .93). The mean follow-up of the stapling and non-stapling groups was 1.4 years (range, 1 month to 2.5 years) and 9 months (range, 1 week to 1.4 years), respectively. No neuralgia or clinical recurrence was noted in either group during follow-up. Cost containment is a major consideration in not stapling the mesh during TEP.12 The elimination of the disposable stapling device, either an endostapler or a helical tacker, can reduce the operative cost by $150 to $300. Another benefit of the non-stapling technique is the prevention of nerve entrapment. Meralgia paresthetica has been attributed to the inadvertent stapling of nerves.13-16 This is supported by an increased incidence of neuropathic complications in patients whose hernias were repaired by tacking the mesh in place.5 However, patients who underwent TEP without stapling were not exempt from neuralgia, which might occur as a result of operative nerve injury or the subsequent involvement of the nerve by scar tissue. This study demonstrated that stapling had no significant adverse effect on the early postoperative outcomes and recovery, in terms of postoperative pain, morbidity, and time taken to resume normal activities. Interestingly, a consistently higher pain score upon coughing was observed during the postoperative period in patients who had stapling of the mesh. The increased pain was probably due to the traction of the staples on the tissue during coughing. A number of studies demonstrated comparable outcomes, in terms of the recurrence rate and the incidence of chronic pain, after TEP with or without mesh stapling.4-6 This frequently led to the deduction that the efficacy of TEP with or without stapling was similar.5 Some centers even advocated TEP without stapling on all patients.6 However, the main drawback of these studies was the relatively short follow-up period. Above all, these studies frequently did not specify the dimensions of the hernial defect.5 The significance of the size of a hernial opening on the recurrence rate remains unknown. Justification for routine non-stapling during TEP is not substantiated. There has been no consensus on the indications for stapling the mesh during TEP. A few multicenter studies have been performed to identify the mechanisms of hernia recurrence after laparoscopic hernioplasty.8-10 Inadequate fixation of the mesh, particularly at the lower medial corner, was found to be a common cause for the recurrence of inguinal hernia.7 Phillips et al10 recommended using the largest possible piece of mesh and stapling it securely. Lowham et al9 suggested that all small prostheses (<12 × 12 cm2) required fixation to the Cooper ligament, the transversus abdominis aponeurosis, and the anterior lateral abdominal wall. Tucker et al17 considered adequate fixation of the mesh critical in preventing early recurrence. Recurrence of a hernia could result from a combination of factors, including technical or judgment errors, as well as mesh migration. Contributing factors to mesh migration, invagination, or folding included hematoma or seroma formation, shear force during movement, disruptive force from elevated intra-abdominal pressure, the use of a small mesh, and inadequate mesh fixation. For small hernial defects measuring less than 4 cm, Hollinsky and Hollinsky1 reported that a minimum distance of 3 cm should be achieved between the edge of the mesh and that of the hernial opening. Otherwise, the mesh should be anchored with staples to enhance the bursting strength of the repair and to prevent subsequent mesh migration. Our strategy of selective non-stapling of the mesh during TEP was based on their findings.1 Our results proved that the selective non-stapling technique was an efficacious method for the repair of unilateral inguinal hernia with a fascial defect measuring less than 4 cm. An accurate measurement of the longitudinal and transverse dimensions of the hernial opening is therefore pivotal to intraoperative decision making on stapler use. Proper documentation of the hernial dimensions also helps to evaluate their effect on the long-term recurrence rate. Other unresolved issues regarding stapling of the mesh include the appropriate site of fixation and the required number of fixation elements. Stapling the mesh at 2 points minimizes the risk of mesh rotation and migration. To reduce the risk of mesh folding or lifting by a hematoma or returned peritoneum, fixation of the mesh on the superior pubic ramus and over the upper medial and lateral corners of the mesh was advocated. Deans et al7 recommended the use of at least 3 staples to fix the mesh to the inferior pubic ramus. Dion et al18 performed an experiment on dogs and demonstrated that the strength of repair was related to the number of clips used. In another in vitro study by Hollinsky and Gobl,19 the stability of the mesh also increased in direct proportion to the number of fixation elements used. A mesh anchored with 4 staples was able to withstand a stress of up to 25 N. Future studies should be directed to evaluate the maximum physiological stress exerted on the Fruchaud myopectineal orifice, which will in turn determine the required physical strength of a hernia repair. Unilateral endoscopic total extraperitoneal inguinal hernioplasty with selective non-stapling of the mesh did not confer short-term benefits to patients, such as reduced postoperative pain and morbidity. For patients with a hernial defect measuring less than 4 cm, TEP can be performed without stapling of the mesh, as the short-term recurrence rates of TEP with and without stapling of the mesh were equivalent. Selective non-stapling strategy helps to reduce the cost of the operation and the potential for nerve entrapment. The application of the non-stapling technique to hernias larger than 4 cm deserves evaluation. A sound surgical judgment with appropriate selection of the mesh size and the use of stapling determines the success of TEP. Corresponding author: Hung Lau, MS, FRACS, Department of Surgery, University of Hong Kong Medical Center, Tung Wah Hospital, 12 Po Yan St, Sheung Wan, Hong Kong, China (e-mail: lauh@hkucc.hku.hk). Accepted for publication May 16, 2003. We acknowledge the kind assistance of T. C. Tan FRCS(Edin) in editing the manuscript.